Place squash on a baking sheet, and bake 40 minutes, or until tender. Remove from heat, cool, and shred pulp with a fork. Reduce oven temperature to 350 degrees F. Lightly grease a casserole dish. 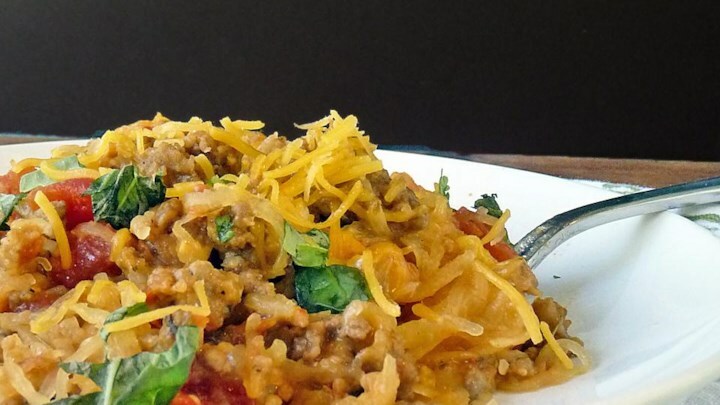 Mix the shredded squash and tomatoes into the skillet, and season with oregano, basil, salt, and pepper. Cook and stir until heated through. Remove skillet from heat, and mix in 2 cups cheese until melted. Transfer to the prepared casserole dish. Note: Ground Breakfast Sausage or Ground Chicken may be substituted if you do not have Ground Beef on hand. 1. Press dressing mix evenly onto all surfaces of beef pot roast. Place onions and garlic in 4-1/2 to 5-1/2-quart slow cooker; top with pot roast. Add bell peppers and broth. Cover and cook on HIGH 5 hours or on LOW 8 hours. Add zucchini. Continue cooking, covered, 30 minutes or until pot roast is fork-tender. 2. Remove pot roast and vegetables. Combine 2 cups cooking liquid and cornstarch mixture in medium saucepan. Bring to a boil, stirring constantly; cook and stir 1 minute or until thickened. 3. Slice roast; season with salt and pepper, as desired. Serve topped with sauce. TIP: Always use grass-fed beef. The fat content is so low, you will not have to separate the fat from the au jus (broth) before making your sauce. Place onions in 5-1/2 quart slow cooker; top with beef, then pepper slices. Combine beef broth, tomato paste, soy sauce and garlic; add to slow cooker. Cover and cook on HIGH 6 to 7 hours or LOW 8 to 9 hours or until beef is fork-tender. (No stirring is necessary during cooking.) Skim fat from cooking liquid, if necessary. Serve beef and vegetables in rolls with toppings, as desired. Serve au jus for dipping, if desired. TIP: This is a great game day dinner! Recipe adapted from National Beef Board.